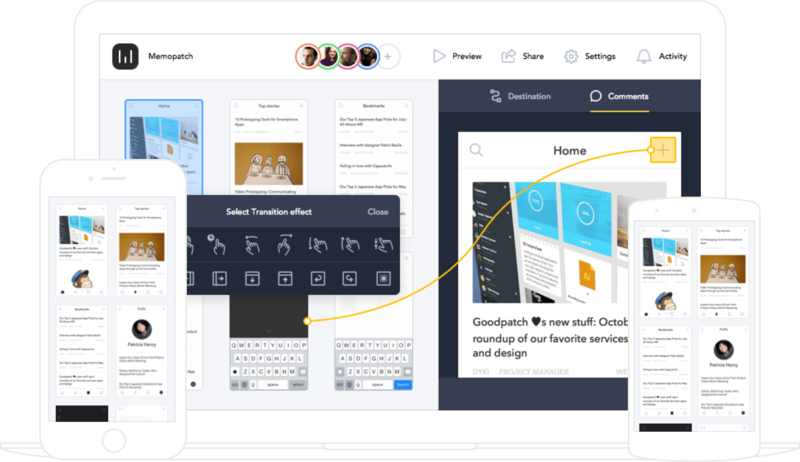 Prott is an intuitive platform that gives everyone a say throughout the entire design process. Create awesome stuff together, with Prott. Just sketch them out, take a picture and make it interactive! All you need is pen, paper, and Prott for iOS or Android. Wireframing has never been easier. Quickly create screens for all interfaces. All you need to do is drag and drop pre-set shapes and UI elements! The wireframe feature comes fully loaded with iOS, Android, web and other commonly used UI elements. Take your pick! Take your efficiency to the next level! Register and save customized UI elements in modules to use later. Enjoy real-time syncing across all devices. Check and update your prototypes anytime and anywhere! Download iOS app now!Download Android app now! Your 'work in progress' will feel like the real deal. Just mark a spot, choose a destination and select a gesture. Sit back and watch the magic happen! Focus on the details while keeping the big picture in mind. Avoid miscommunication by sharing an up-to-date detailed map of your prototype in all it's interactive glory, anytime. Send projects to your team members via a single URL — no descriptions needed! Show off your progress and get feedback in real-time. Better communication leads to better results! Leave a comment anywhere within the project to get the conversation going, and encourage feedback from your team. Present impressive prototypes that work like a real app! Personalize the presentation by changing the background and device color, or create your own customized design. Enjoy native prototyping and test on any target device of your choice. Prototype on the go with real-time synching across all Prott platforms ranging from Web, iPhone and Android. Prott loves Slack, Dropbox, Sketch, and other pals out there! Develop ideas faster through our ever-growing collection of plug-ins. Prototypes can be created to function on various devices. By setting a password for the presentation mode, its access can be limited. Search for and access screens. Create groups withing the organization to manage projects easily. Co-edit easily by sharing access with others. Ability to utilize programs such as Slack and Sketch. As project owner, instantly check what members have done. Ability to see project history and revert to previous screen. Ability to lock a project, limiting access. The free trial includes unlimited access to all features of the Pro plan. No credit card information required. Free forever. Get started now!Get started now!Get started now! Start your free 30-day trial now! What is your company name? How many people are part of your current project? What category does your role fir under? Are you in a leadership position? After the trial period ends, your account will be automatically downgraded to the Free plan. What will you be using Prott for? Prott is available for web and iOS app. We do not support smartphone web browsers. Please use Prott iOS app or PC web browsers. Prott is available for web and Android app. We do not support smartphone web browsers. Please use Prott Android app or PC web browsers. Prott updates, awesome tips and much more! Google Chrome is recommended for the best viewing experience in Prott.